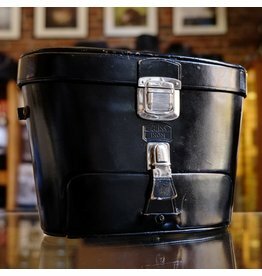 Zeiss Ikon case for three lenses, Contarex Super film back. Black leather with some surface flaws, clean interior. Zeiss-Ikon Super Contarex Super 3-lens + back case. 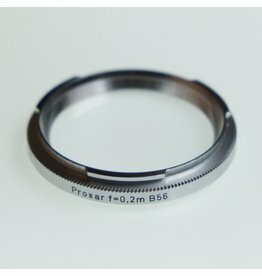 Carl Zeiss Proxar 0.2m diopter lens for B56 bayonet filter mount. Includes case. Zeiss-Ikon Proxar diopter set (4pc) in A28.5mm slip-on size for Contaflex cameras. 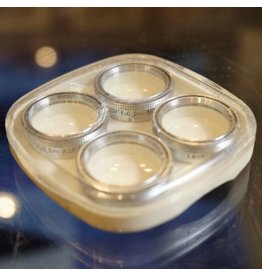 Complete set with 0.2m, 0.3m, 0.5m, and 1m diopters in a case with built-in focus calculator. Optics are excellent, case is in fair condition. Zeiss-Ikon Proxar diopter set (4pc) in A28.5mm slip-on size.